RiKON - XerGlo - KonDanka - What is an HP Dealer to do? During an interview the other day, I was asked some good questions...Questions I really could not answer. 1. How will Canon survive losing 30% of US sales? 2. What will happen with all the existing, independent Ricoh dealers? 3. How many independent dealers still exist? 4. How many locations does CBS have? 5. What will the industry look like in 5 years? 10 years? 6. How does this affect the RBS channel? Wow. As the dust settles, the huge significance of what just happened is almost more than we can bear. The questions posed to me illustrated how much I really don't know. How is Canon going to respond to losing 30% of its US sales? Dang, that is a good question. From the Canon Business Solutions web site, there are only 53 locations in the US. And Ricoh says it is going to convert IKON's Canon base into Ricoh MIF within the next 3 years...oh really? Do you think Canon might have other plans for those "Canon customers bobbing in the wake of corporate takeover"? And, how is RiKON going to survive losing nearly 60% of it's business? Or not being able to service those existing customers after the de-certification? The bigger question - Why have all these manufacturers purchased the channel to begin with? I don't see Ford or IBM buying up dealer associations - cereal makers buying grocery chains, or cattle herders purchasing McDonald's restaurants. "...we manufacture and we manufacture very well...we don't have the infrastructure or the knowledge to successfully market, sell or support our finished goods, to the ultimate customer..."
Has Konica Minolta discovered how easy it is to sell to the ultimate consumer? Do Ricoh and Xerox think they know better then the folks who have developed and maintained the current channel and selling model? --- Maybe "yes" AND maybe "no". "All copiers are the same - every single one." Look at it, now there are only three main channels each driven by a "manufacturer". Manufactures of "xerographic" machines - they are all the same. The differentiating factors will be interesting to watch - and the marketing will be fascinating. 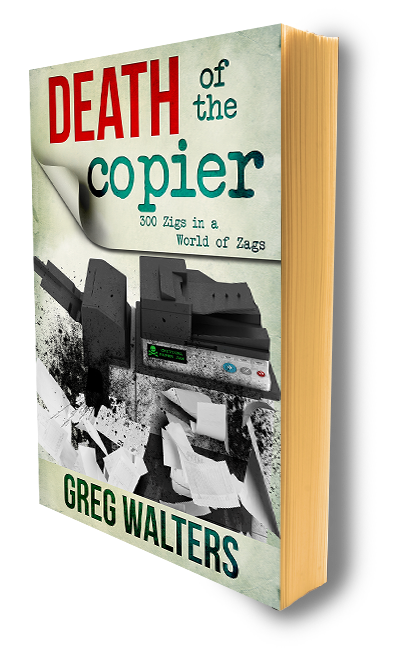 Like a caterpillar suspended in it's chrysalis, the metamorphosis of the copier industry moves into a new phase. What emerges will be the "Hybrid Dealer" you have started to hear about. Never before, in recent hi-tech history, has a channel been assimilated like this. Change is guaranteed. In the 80's the PC market was booming but not one manufacturer tried to own the channels - what changed? I mean "consolidation" occurred but through manufactures buying other manufactures and software companies adapting or going away. The channels responded, contracted yet remained intact. The number of distributors thinned as did the quantity of machines - but the channel remained. It's the Economy - Stupid. I guess if we look at this phenomena in a macro sense, from 10,000 feet, as an investment, these acquisitions look good. The stock holders realize a tidy return on their investment, the folks who built the channels(Global, IKON, Danka) can retire rich. The remaining, small independent dealers can now start looking at Canon, Toshiba, Sharp, etc. as equipment competitors more willing to work with then just 12 months ago. Especially Canon. As for the employees - they can hang on, or move into one of the smaller competitors and help them thrive on all the industry chaos. How does the Customer benefit? Does all this consolidation mean a more competitive industry? Does this give prospects more choices? Will prices and margins be driven down even further? Right now there is Xerox, Konica and Ricoh - the Very Big Three - and Canon all by itself. So it looks like the customer's choices have just been limited - is that a good thing? In the short run Canon customers looking to upgrade can leverage this change over Canon possibly resulting in lower pricing as Canon defends the base. But RiKON will go after all the Canon customers with a price point designed to "buy the business" - this could be good for the customer; these two giants fighting over the customer. The company with the largest number of MIF (machines in field) is now nearly transparent. And Edgeline is the humongous gorilla in the room of every single sales meeting in every single IPG office at HP. End of year for HP is October 31st - and I am sure that upper management is "monitoring" Edgeline cycles down to the minute - HP is not use to being in the copier industry. Competitive pressures were not fully appreciated and channel breadth might have been over rated. How can you expect to push 3,400 units - big, huge, wonderful, new technology units - through approximately 120 dealers? And convert "direct sales people" into document management consultants, overnight? Edgeline is not a new laser printer; you can not sell it off a price sheet, over the phone. The selling cycle for these types of units(copiers) is much more complex and usually triggered by an event - lease termination. And if you have no machines in field to begin with, every single unit is a new sale converting a competitor's existing lease. The sale of an unproven, relative to all the copiers, technology from a "new" player only adds to the pressure. And if this isn't enough- HP sales people are swimming in a part of the ocean inhabited by some of the smoothest, most savvy, and ruthless Sales Sharks in the world - Copier Guys(or gals). The copier folks know how to talk CPC, leasing, 4 hour response time, real service levels and of course, first copy out time(yuck). "OEM toner is way too expensive..."
"If HP is serious about getting into the copier industry, why do they price CPC so high?" "Why is there no 3-hole punch?" "...you mean this big machine can't handle glossy?" " ...the rebates are too difficult for us to manage..."
Be that as it is, perception is reality. Again, not my reality. Edgeline is a great platform, HP just needs to work through the "growing pains". Some very good HP partners are here who DO believe and are willing to "tow the line" - for now. Well, as with everything, time will tell - history will judge. And as Selling Professionals, Agents of Change, we don't hide from history, we make it. Dealers will have to live with the fact that pricing wars will ensue, but their level of services must enter and grow stronger. Manufacturers can't compete in this arena generally. However, with the purchase of IKON, Ricoh has acquired a very sharp team of professional services agents. If you stack these up agains IT ISV's, I'm not sure the talent matches. But consultants are not always known for their "handshake ethics", instead preferring to charge you for everything they touch. But with copiers and printers being at the end of a customer's network - and always (read: ALWAYS) viewed as commodity items and something a monkey can program - how does a dealership build value on that? Thus MPS was born... a reasonable value for the customer, or an attempt to justify spending money with the dealer? Can manufacturers successfully enter the MPS space, or do they even care? Toshiba has been buying up the retail channel for a couple of years, before either Xerox or M/onica, by buying their own dealers up, one at a time, over fifty so far, covering almost every state. Toshiba has also bought competitive dealerships when the price or market share were right. Many of these acquisitions also sold Ricoh or one of the other Ricoh labels. So Toshiba is actually ahead of the others. Ricoh is reacting to losing market share. Also, your comparison to the automobile industry is incorrect. Ford Motor Co. attempted in the late 90's and early 00's to have corporate owned dealerships. One such "experiment" was in Rochester, NY, where they owned 6 or 7 dealerships. After less than 5 years they were all independent dealerships again. Most of these manufacturers have only themselves to blame. They stick the dealers with poorly engineered products, warranty repairs that aren't reimbursed, and stole the most lucrative parts of the business for themselves. When was the last time a customer bought a letter/A4 only machine in a dealership instead of BigBoxOfficeStore? How many of the schools and churches are being sold directly, from OEM ads in their "trade" magazines? How many dealers get burned from first generation products, and even second gen, not being up to snuff (Ricoh B051/B052 series for example)? And nice catch with, "Also, your comparison to the automobile industry is incorrect. Ford Motor Co. attempted in the late 90's and early 00's to have corporate owned dealerships. One such "experiment" was in Rochester, NY, where they owned 6 or 7 dealerships. After less than 5 years they were all independent dealerships again." I did not know this fact so thank you for sharing. And yes, the manufacturers do seem to "cherry pick" the better opportunities and sometimes "sell around" their own channel members...I have seen examples of this in many other industries. Have they been the "quiet" one in the room or what? I hear from customers that Toshiba is buying up dealers all over and has been for a while now. On the other hand, unfortunately, whenever I run into a Toshiba customer - it is almost like talking to an IKON customer - they are not happy. And as some have called the IKON agreement "captive" a majority of the Toshiba leases I have, are just this side of criminal. Nice comment, keep them coming.